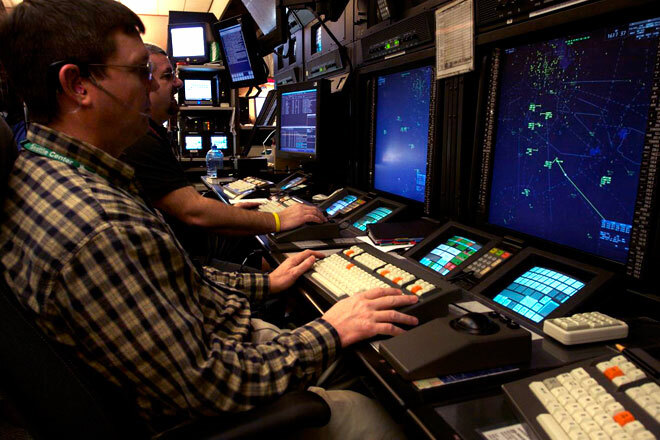 As a Center/EnRoute controller, you will be assigned to an Air Route Traffic Control Center (ARTCC). Centers are responsible for thousands of square miles of airspace and generally handle aircraft 10,000 - 18,000 feet and above. In less populated areas, centers may handle aircraft below 10,000 ft, actually providing guidance to aircraft into airports. Depending on which Center one is assigned, a controller may be responsible for an oceanic sector which means you will actually have control of the aircraft over the oceans bordering the United States. Air traffic controllers separate aircraft primarily by RADAR, but can use other means when RADAR coverage does not exists, such as spacing aircraft by time. Centers generally handle Instrument Flight Rules (IFR) aircraft. Aircraft flying IFR rely on air traffic controllers for all vectors (turns), altitude assignments, and separation from other aircraft. The other type of aircraft a center may handle is visual flight rules (VFR). Center controllers provide VFR aircraft advisories, vectors, and altitude changes, but it is still primarily the pilots responsibility for separation from aircraft, obstacles, and terrain. ARTCCs are also responsible for setting up the initial sequence of aircraft into the airport of intended landing. A center controller will begin descending aircraft and lining them up hundreds of miles away so when they transfer control of the aircraft to the TRACON controller, the aircraft will be in an arrival sequence for the airport of intended landing.